Bluefin tuna are being hunted to extinction. Find out what you can do. Ever since I had the dream come through of swimming through a school of 20+ bluefin tuna in the Azores, I have been sort of obsessed with the lifespan and future of this iconic creature. While sushi for a long time has been one of my favourite dishes, I have a couple of years ago decided never to eat bluefin tuna again. The reason is simple. 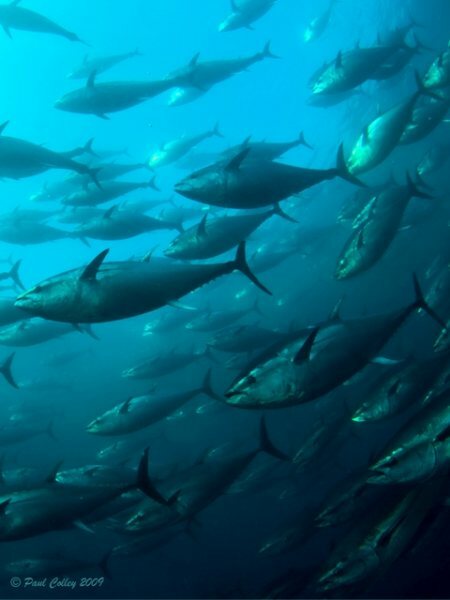 Because a lot of people in the world like bluefin tuna (probably the best fish meat out there), in the last 30 years global stocks have dwindled over 90 percent. Scientists now predict that at the current fishing rate all the world's bluefin tuna could be fished out within a few years. 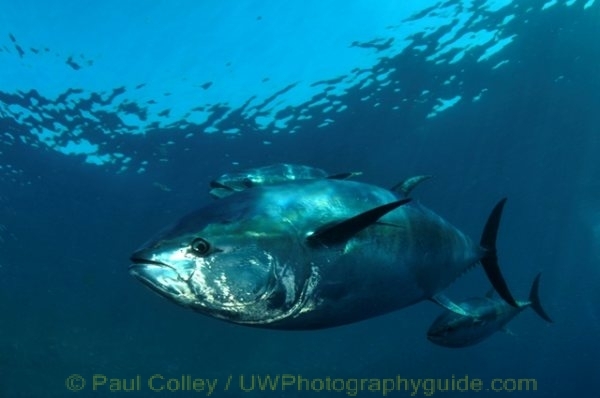 But before we go into all the doom and gloom (yes, there is some pretty sad news coming up later), let us go back and see what makes the bluefin tuna such an amazing fish; a fish that very few photographers / scuba divers have encountered in the wild. Bluefin tuna are capable of reaching well over a thousand pounds (453.59 kilograms) in weight, and rival the black marlin and blue marlin as some of the largest known bony fish. Bluefin tuna have been clocked in excess of 30 miles per hour (48 km/h) during 10 to 20 second sprint (with faster acceleration than a Ferrari! ), which makes it very capable to catch any fish it wants. Bluefin tuna can live for 30 years, but due to heavy fishing mortality, few known specimens grow to a mature age. There are three bluefin tuna populations in the world; the Atlantic bluefin tuna, the Pacific bluefin tuna and the Southern bluefin tuna. 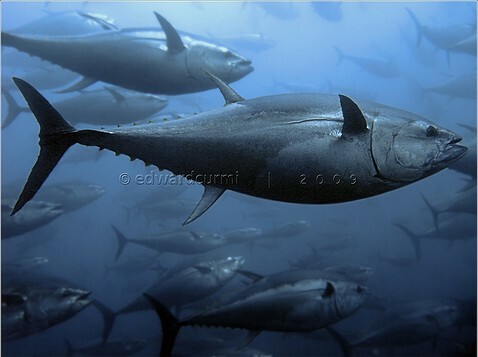 Tuna travel thousands of miles across the Pacific and Atlantic oceans, which are traditional migratory routes. TOPP tags the Pacific bluefin tuna, which allows you to keep track of their exact migratory routes. The story of giant Atlantic bluefin tuna began with enormous abundance, as they surged through the Straits of Gibraltar each spring, fanning out across the Mediterranean to spawn. Over the years, fisherman devised a method of extending nets from shore to intercept the fish and funnel them into chambers, where they were slaughtered (called the Mattanza - portfolio by Norbert Wu). By the mid-1800s, a hundred tuna traps—known as tonnara in Italy and almadraba in Spain—harvested up to tens of thousands of tons of bluefin annually. The fishery was sustainable, supporting thousands of workers and their families. Today the Atlantic bluefin tuna is losing it's fight for survival. 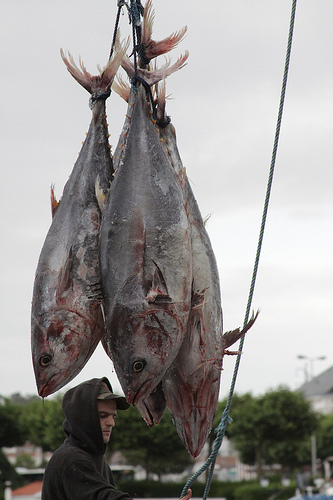 Because catches have shrunk significantly, fishermen developed “tuna ranching”. Ranches consist of huge circular nets anchored where bluefins are glutted on mackerel, sardines, and pilchard until they are fat enough to be slaughtered. The Ocean Conservancy’s George Leonard calls tuna ranching “the least sustainable form of aquaculture on the planet.". At the last CITES (Convention on International Trade in Endangered Species) there was the opportunity to take appropriate measurement to protect the species. However, as expected, the proposal to ban international trade was rejected by Japan and Russia. The Japanese market for bluefin tuna is enormous, employing more than 100,000 people and a revenue of $5+ billion a year. Just a couple of days ago, a single bluefin tuna has been sold for the highest price in the past nine years at a Tokyo fish auction. The 232 kilogram (511 pound) fish was sold for 16.28 million yen, or a bit over $175,000. That makes 342 USD per pound! While this is a record, this season might very well be the last season EVER that a bluefin tuna is sold..
Because while on the one end of the Atlantic Ocean, fisherman are taking out 22,000+ tonnes bluefin tuna, on the other end of the Ocean a major disaster is happening. The massive oil spill in the Gulf of Mexico could not have happened at a worse time, or in a worse spot. "The giant bluefin only show up for about a month, and this is the time they show up," Stanford University marine biologist Barbara Block told AOL News. "Bluefin tuna are moving to the Gulf of Mexico exactly right now to spawn." Plus, she said, the spill is centered around one of the preferred breeding areas. "Many of the tuna go exactly to that region." The exact consequences of this disaster are yet to be seen. A world without bluefin tuna? 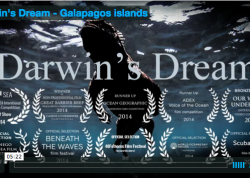 Diving in our oceans would never be the same, knowing that the unexpected encounter you have always been dreaming about is never going to take place. ps. For those that have to see the tuna in real life, there is an ultimate option: travel to Carloforte, Sardinia. Isla Diving offers dive excursions to dive in a ranch between a school of hundreds of Bluefin Tuna. Schooling bluefin tuna, Photo by Paul Colley. Taken in Malta in a Bluefin tuna farm. Nikon D300, Tokina 10-17mm lens, 2 Inon Z240 strobes. Bluefin Tuna in İzmir - Çeşme, Turkey, Tuna farm, photo by Aziz Saltik. Sea & Sea DX5000-G, natural light. 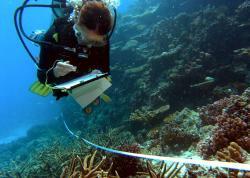 The pen was 37 meters deep and 60 meters in diameter. We did 4 dives there and the average population in the pens were about 250-300 blue fin tunas per cage. The fish are caught in the Mediterranean sea and towed to İzmir at a speed of 1 naut. mile per hour, the fattening takes place for 4 months and then they are "harvested" and exported to Japan. 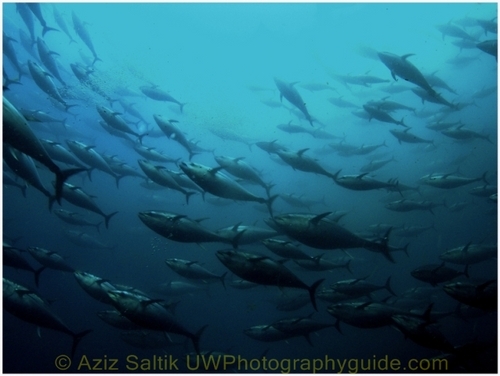 Paul Colley supplied underwater photos he took in Malta at a bluefin tuna farm. You can see his work at www.mpcolley.com. Thanks also to Edward Curmi and Aziz Saltik for their underwater photos.